There are many articles about Tesla, his inventions, his quirks and the sad fact that much of his more advanced technology is still not in use or is - as with the US HAARP project - used for purposes that may not be in everybody's best interest. So when reading this article forwarded by a reader from Mexico, I asked myself "do we really need another one of these Tesla articles that can only repeat what has been said before?" Some time ago, I had an exchange of ideas about Viktor Schauberger, another man who was much ahead of his time and at loggerheads with the current technological culture. The upshot of that exchange was, that it seemed to me that to really understand Schauberger's technology, we must not only look at the technology itself, but at the spiritual dimension of the person. Both Schauberger and Tesla were deeply spiritual and obtained the clues for their inventions from that spiritual world beyond our ken. It was their intimate connection with a world beyond the visible which helped them formulate novel ways of doing things - often counter-intuitive and in stark contrast with the technologies available during their time. So when that Mexican reader sent me an article about Tesla, I was doubtful at first. But anyway, I started reading and saw that it does give a good idea of the spiritual dimension of Tesla's life and work, perhaps better than any other Tesla article I have read. And so the answer to the question - do we need another one of these articles - was answered in the affirmative. We need to have this information if we are to get closer to understanding those parts of Tesla's work that are still hidden from view, or that are being used in covert military programs for ends about which we really have no clue. The article was written by Prof. Velimir Abramovich and was first published in Issue 1 (4) of Alexander Frolov's New Energy Technologies magazine. Although both Abramovich and Frolov make their own comments, enough of Tesla's original thought comes through to make it a very worthwhile read. I did some editing of the text for better English comprehensibility. The article is rather long, but it is full of good information. Comments, as always, are of course welcome. Things were created rather in the minds of angels, than in Nature, i.e. angels had all things clear in their minds and thoughts before they got a real existence. Words by Saint Augustine cited by H.P. Blavatskaya in her book "Secret doctrine"
"I will not work for the present any more, I am working for the future" - said Tesla to journalists in New York City more than seven decades ago. - "The future is mine!" Inventor of alternating current, polyphase motor-generator, reversible magnetic field, radio, teleautomatics ... Tesla was the inventor on whose patents the energetics of the twentieth century is based. He worked for decades in seclusion on an explanation of cosmic processes, his desire was to join the material and the spiritual in a theoretical work, just like he did in his practical discoveries. Nikola Tesla's name is now mainly connected with the so-called Tesla coil, the inductive motor and an international unit symbol of measure for magnetic field strength. Many facts of his life and his extraordinary creative gift have been forgotten. Tesla spent the most productive period of his creative work in the USA. He patented more than 300 inventions in different countries. Many of them have not been repeated to this day; for example, his receiver of radiant energy. We know nothing definite about its principle of operation, besides that it may be some kind of a transformer of cosmic energy rays. In the period from 1899 until 1900, Tesla devoted himself to research of electromagnetic oscillations of very low frequencies in his specially built laboratory in Colorado Springs. Two years later he began to build a World Transmission Station on Long Island near New York but he didn't finish it. Tesla's friend, the American steel magnate J. P. Morgan financed this experiment. After this project was aborted in 1905, Tesla until his death preferred to work alone, far from public view. But this period was not without new discoveries. Just at that time, being a mature scientist, he came to fundamental conclusions which should become a new milestone in future science. We know from history that when scientific thought finds itself at a crossroads, scientists look to the past seeking support and inspiration. Let's try to answer a number of important questions. How did Tesla make his discoveries? These discoveries are: influence of super low-frequency electromagnetic waves on biological systems, especially on the workings of the brain, merging of energy structures, so called "fire balls", which he produced by inductive fields of primary and secondary electromagnetic coils, superconductivity of natural and artificial media, wireless energy transfer and so on. What are the main axioms of Tesla's cosmology? How do they follow from his metaphysics? How did he apply them in his physical experiments? Why are theorists and empiricists of modern physics of our time so interested in the reconstruction of Tesla's theory of physical reality and his views on electromagnetic phenomena? Why didn't Tesla formulate his scientific theory and publish it? Can Tesla's views on the ethical aspect of scientific discoveries help to refine modern natural sciences, especially physics, which is in a crisis of ideas now? What can we expect from studying Tesla's concepts in the near future? Would it be an exaggeration to say that Tesla in 1900 laid the groundwork for the possibility of our global information-oriented society with his famous "World-Wide System" project? Could that be the actual technical and technological basis of what we now call a "New World Order"? Shall we consider Tesla to be a spiritual precursor of a new scientific and technological civilization named Tesliana, where the technology of "time design" is prevalent and where an inexhaustible energy source is the asynchronicity of various levels of physical processes. (Editor's note: Time as an energy source is the most important topic of many research efforts. How can we explain this in simple words? To my mind it is the difference in the energy of oscillations that is formulated as E=hv, where v is frequency, that is dependent on scale of space, i.e. velocity of the course of time. Let's assume that some system of energy E can be moved from space A into a local space of accelerated time B. In comparison to space A this means an increase of energy since the wave-length in space B should be shorter. Let's assume some "bridge" or "energy exchange channel" between space A and space B. In this case we'll be able to create some energy exchange between A and B due to a natural gradient of energy density. Prof. Abramovic wrote about "asynchronicity of various levels of physical processes" but a more accurate notion here would be "relative difference in the speed of time", which connects with speed of light and physical properties of space. "Asynchronicity" can be detected for two oscillation processes of the same frequency but in this case it cannot be used to produce a gradient of energy density. Let's return to the middle of the nineteenth century, to the little village of Smilyan in Lika, which was an Austrian-Hungarian province. In this village, on July 10, 1856, the Serbian Orthodox priest, Milutin Tesla, saw the birth of his fourth child Nikola. "In my boyhood I suffered from a peculiar affliction due to the appearance of images, often accompanied by strong flashes of light, which covered the sight of real objects and interfered with my thought and actions ... When a word was spoken to me, the image of the object it designated would present itself vividly to my vision and sometimes I was quite unable to distinguish whether what I saw was tangible or not." "Then, instinctively, I commenced making mind trips beyond the limits of the small world of which I had knowledge and I saw new scenes. These were at first very blurred and indistinct, and would flit away when I tried to concentrate my attention upon them but, by and by, I succeeded in fixing them; they gained in strength and distinctness and finally assumed the concreteness of a real thing. I soon discovered that my best comfort was attained if I simply went on in my vision further and further, getting new impressions all the time, and so I began to travel - of course in my mind. Every night (and sometimes during the day) when alone, I would start on my journeys, see new places, cities and countries, live there, meet people and make friendships and acquaintances and, however unbelievable, it is a fact that they were just as real and dear to me as those in actual life and not one bit less intense in their manifestations. This I did constantly until I was seventeen, when my thoughts turned seriously to invention." "The moment when somebody designs an imaginary device, there is a problem of putting the raw idea into practice. That's why any discovery made this way has lack of details, and usually it is inferior... My method is a different one." He did not rush into empirical work. When an idea appeared, he immediately began to elaborate it in his imagination. He would change its design, improving it and would "switch on" the device to observe its operation in his head. It did not matter for him whether he tested his invention in the laboratory or in his mind. He even had time to notice if something prevented his invention from working properly... This way he could develop a perfect idea without physical touch. Only after that he would give concrete form to this final product of his mind. All his inventions were developed by this method, with no exceptions, during twenty years... There is hardly any scientific discovery that can be foreseen only mathematically, without visualization... Introduction of unfinished, crude ideas into the process is always a waste of energy and time. Studying the mechanisms of his mental life, Tesla found that visions "from virtual reality" always had certain connection with events of "true reality". He soon was able to find the cause for this. He was glad to understand that every one of his thoughts was a result of influence of external impressions. He noted that not only thoughts but actions also come about in the same way. Some time passed and it became clear to him that he was only a kind of "automaton of cosmic forces" endowed with abilities to move, responding to stimuli of sense organs and thoughts. His invention of teleautomatic control many years later was a result of this conclusion. He understood the laws of this control through what was at first only an unclear feeling of external conditioning of his own behavior. Nikola Tesla used imagination as a psychological precursor for well-ordered disclosure made by mathematical methods. We can say nothing of this kind about his contemporary inventor Thomas Edison, because he had "weak knowledge in mathematics, and he was mainly guided by long and laborious experiments". In his records, Tesla often spoke about his predisposition to using mental processes. These processes correspond to the principles Nature uses. He considered this inborn gift to manifest as a "diffused pressure", an idea of the need to make another invention, because the experiment of a previous researcher was short of something. Here he sees not only a source of invention in general, but also some proof that the law of a different reality affects man. In short, Tesla considered creative imagination to be a step in the act of conscious discovery. According to his words, certain conclusions were born in his mind spontaneously, in the form of geometrical images. Then followed the understanding of the principle of the discovery and its physical interpretation. Only then mathematical formalization took place, followed by finding materials with the necessary technical properties essential for the continuous operation of a constructed physical model. The work on inventions was for him mainly a struggle for mental clarification, i.e. the elimination of secondary ideas and minute details, which blur the imaging principle and complicate the approach to the real nature of relations between fundamental geometrical elements. According to Tesla, the process of understanding the principle had to be considered, finished and ready to apply, when the connection between geometrical objects was stated. Thus, discovery appeared in the moment when the correspondence of elements and their physical manifestations was defined, so a physical law can be found, which rules in the real world, in the algorithm itself. For Tesla, an idea finds its manifestation already in the act of creative thinking. Only after that, a choice of operating parameters of the specific device takes place, which follows from general understanding. This result can be a design of the inductive motor or a model of the rotating magnetic field. As he told it, he mastered a method of far reaching mental improvement, so he even made very small corrections to his discovery in his mind, without any physical check. This can provide a clue to the secret of his work, which was extensive, taking into consideration all his scientific and technical innovations, and it is a remarkable fact. Tesla also made a hypothesis on the extraordinary effect of external stimulus on human thinking and memory. Referring to Rene Descarte's theory, he concluded that subjective human work and human life as a whole has a feature of automatism, which is stipulated by the cosmos. According to Tesla's evidence, creativity as the appearance of unknown visual ideas can be the consequence of automatic operation of brain, that's why he developed an additional supposition about the reverse effect of brain visual centers on the retina. Here he sees a reason for the appearance of his images, which led to his discoveries. Thus, through human brain processes and information from an external stimulus, the human brain can create new images and relations (associations) between reflected phenomena of the real world and images of the imaginary world. And finally, there is Tesla's opinion that thought, memory and motion are feedback processes, that's why we should mention that attempting to understand his inborn gift of invention, he also understood the role of cybernetics as a reflection of cosmic principles of material and informational organization. Believing that the Universe is alive and people are "automates" to some extent, acting according to a Creator's plans, Tesla made an original theory of memory. He considered that the human brain does not have the ability to remember in the sense which we usually consider it to do (in a biochemical or rather biophysical way) and that memory is only a reaction of the human brain to recurring external stimuli. Really, it seems unusual that Tesla, who had a very good memory (he spoke seven or eight languages) and an ability for eidetic imagination (photographic memory), was sure that there is no human memory as such. It is of great importance that the author of several hundred scientific discoveries didn't consider his creativity to be his own desert and surely stated that he is only a conductor of ideas, which come from the World of ideas to the World of people and practice. All this is not so contradictory if we remember that he, being a son of a priest, answered to the question about his religion that he believes in the only God, which has no description in any religion and his religion is the closest to Buddhism. Later Tesla himself became closer to Buddhism, he even got into yoga, rational nutrition, meditation and the last years before his death he lived as an ascetic in New York like an Indian guru or Orthodox saint. "In some certain moments I noticed that all the air around me was full of tongues of real flame. The intensity of these tongues grew after a number of years instead of falling and reached its maximum at the age of twenty-five. Once I had a feeling that my brain was enveloped in flames and a little Sun shines in my head". "These light phenomena sometimes still appear, especially when some new idea shows me unprecedented possibilities, but their intensity is relatively weak". "Only once in my present existence I experienced something that looked like supernatural. It happened during my mother's death. I was ill and exhausted with fever, and was lying in bed. Suddenly I thought that if my mother dies far from me, she possibly would give some sign. Two or three months later I was in London with my friend, the English scientist sir William Crookes, where there was a discussion about spiritism. I was impressed by his argumentations and remembered his work on "radiant matter", which I read when I was just a student. Due to this work, I realized my vocation to be an electric engineer. I thought that prerequisites for looking "beyond" were favorable since my mother was a woman with extraordinary intuition. All night every fiber of my brain was strained in expectation, but nothing happened until morning, and only when I fell asleep or maybe began to nod off, I saw a cloud, which carried angel figures of divine beauty. One of them looked to my side with love, and little by little I recognized in it my mother. The ghost was flying along the room slowly, and finally disappeared. I abruptly woke up with the sound of indescribably pleasant voices. In this moment a certainty, which cannot be described by any words, came over me: I knew that my mother had died. And it was true". The same day Tesla sent a letter to Crookes under the influence of this vision and still being ill. These two scientists were in correspondence for many years, but Tesla's letters to Crookes disappeared together with Crookes' archives in 1918. Crookes' huge collection of scientific material contains numerous records of spiritistic seances held in a strictly scientific and experimental manner and many hundreds of pictures with materialized ghosts from different historical epochs. The Tesla museum in Belgrade keeps Crookes' letter to Tesla of 1893, where Crookes thanked Tesla for a special electromagnetic spiral coil sent to him. This spiral created a field which made contours of ghosts clearer and at the same time it had a positive effect on the medium's condition making an experiment easier. At the same time when Crookes began his scientific studyies of spiritistic phenomena in London, Mendeleev began to do the same in Saint Petersburg in the 70s of the nineteenth century. A committee of specialists formed in Saint Petersburg concluded after a short investigation (about ten experiments) that it is nothing but superstition. Since that time, both in England and Russia, science has been subdivided into a secret, "factitious" kind including Tesla's physics of the ether and a clear, "real" one - university science of commercial and even political direction, for example, nuclear physics and theory of relativity. In theoretical and experimental physics of the twentieth century, we can clearly define three different styles of thinking. Quantum mechanics, relativism (near-light speeds) and traditionalism. Tesla belonged to the latter - he really was a non-recognized scientist of the future and tried to find truth, i.e. the real nature of time, space and especially the essence of motion. Before we go into Tesla's metaphysics, namely into the world of fundamental processes of his physics, let's try to pinpoint the place, where Tesla ranks in the world of modern scientific systems. Plank's constant, Heisenberg's uncertainty relation, the Pauli principle and the wave function by Shroedinger were the main theoretical instruments of the quantum mechanical approach to cosmic phenomena. The main goal of quantum mechanics, which is to discover fundamental or elementary particle of matter, is still not realized. In spite of great success in studying the process of chain reaction activation, the physics of the atomic nucleus and the process of formation of nuclei of heavy elements from nuclei of light elements, many things are still mysterious and they are beyond our technical ability to control them. Considering a tendency of general development, we can state that the productive basis of the notions of quantum-mechanical physics is exhausted. It has become evident that we should research such categories as time and space again, at a deeper level of realization, at ontological levels, to determine the true nature of physical processes. The special theory of relativity by Albert Einstein, published in 1905 in the German magazine "Annalen der Physik" marked the second milestone in theoretical physics and used Minkowski's four-dimensional space-time continuum as a model of physical reality. The third method to understand physical reality relates to Tesla's ideas. Starting from works by M. Faraday and D. Arago on the one hand and L. Galvani and A. Volta on the other, Tesla could create his own original theory of the world on the basis of a theory of acoustic resonators by Helmholtz and a modification of Lord Kelvin's ether model. This theory gave outstanding results in experiments. The initial axiom of his theory was that the universal energy of a physical system is based on the laws of resonance of vibrations, on the coincidence of oscillations of the system's parts. He considered that the theory of ether cannot be excluded from physics, because it is impossible to completely and strictly separate matter and space. It is Tesla's opinion that electrified state is a fluid state based on the substance having the properties of perception and elements of consciousness. In mathematics, the scientist followed a realistic approach, holding the idea that the properties of mathematical and physical objects directly correspond to each other. In the experimental approach, the Greek mechanician Archimedes served as an example. Archimedes stated that "time should be excluded from physics" as an excess phenomenon. It should be noted that even in the nineteenth century scientists Heinrich Hertz and D'Alambert tried to create a theoretical physics without the notion of force, but this attempt failed. Russian scientist N.A. Kozyrev followed in their footsteps, but his theory also did not advance to a level of practical application. The problem of the relation between force and time in physics is still not settled. Tesla's experiments mainly consist in the ascertainment of deep common properties of physical systems, which should be brought into resonance. Evidence for this was his complex electromagnetic oscillator, Wardenclyffe Tower (built on Long Island near New York in 1901-1905). He could make simultaneous vibrations of the ionosphere and the globe by means of this tower. In mathematics as well as in physics, Tesla was a follower of strict determinism. He held mathematics in high regard, but also considered that physical processes could be described not only by mathematical means. It is Tesla's opinion that control of process should be achieved by foresight; just the foresight provides control. This position is radically different from that of the theory of relativity. According to this theory, objective (immediate) cognition is impossible and reality is recognized through mathematical calculation. The views of Tesla and Einstein on the problem of physical reality are fundamentally different. According to Einstein, human experience is relative, fictitious and doesn't correspond to true physical reality. For Tesla physical reality is universal and penetrates all levels of cosmic existence, i.e. nobody in any way can avoid certain cognition of the truth. According to Einstein, Ether is not a real category, but exists as a result of fallacious scientific opinions. For Tesla, Ether is a unified undifferentiated field, which consists of time, space and energy. Formation of matter is a result of resonant processes in the ether. According to Einstein, Time is only in the rank of phenomena, it is not a substantial physical entity or even category and it is registered only by means of measurements with reference to every system. For Tesla, Time is a real algorithm of materialized Mathematics and it is created from Ether due to resonance of physical systems, and it returns to Ether. According to Einstein, maximal speed is achieved in Vacuum, it is a speed of light equal to 300 000 km/sec. For Tesla the speed of electromagnetic waves is not limited. Experiments and calculations were made and showed that transfer of waves and energy at any distance is possible in principle. The speed of mechanical and electrical waves penetrating the Earth highly exceeds the speed of light in vacuum. Speaking to his friends, Tesla often refuted some of Einstein's statements, especially those which were related with curvature of space. He considered that it breaks the law of action and opposite reaction: "If curvature of space is formed due to strong gravitational fields, then it should become straight due to opposite reaction." Einstein was a pure theorist and Tesla was mainly an experimenter. There is no information about contacts and talks between these two scientists. Nevertheless, Einstein congratulated Tesla on his 75th birthday. He underlined Tesla's most important merit in science, the multiphase system of generators and alternating current motors, which is really one of his less important discoveries. "We shall have no need to transmit power at all. Ere many generations pass, our machinery will be driven by a power obtainable at any point of the universe... Throughout space there is energy..."
There is no doubt that Tesla had a great feeling of the unity of terrestrial nature and cosmic processes. He brought the essence of his "World system" (announced in 1900) to 12 positions, which reflect the very essence of a modern technical and technological network of world telecommunications. This system is also a technological basis to establish a global information society. The tendency of this kind of society to universal unification is manifest today in many ways. Tesla constructed his "World order" starting from principles of his own inventions. Let's enumerate some of them. These are Tesla's transformer motors, i.e. device for creation of electrovibrations with specific properties; a step-up transformer specially designed to excite the Earth (this device with its electrical transmission can be seen as analogous to a telescope in astronomy). Then, Tesla's wireless system including a certain number of devices, which is now considered to be an unsurpassed method for the transmission of electrical current without wires; a device for individualization of signal, which in comparison with a primitive method to match signal means the same as advanced language in comparison with inarticulate mumbling. Due to this device, it is possible to transmit secret signal both in passive and in active form, because they do not interfere with other transmissions and cannot be jammed by other signals. Any transmission is unique in its rhythm and has individual features; actually, it is an unlimited quantity of stations and instruments, which can act on one or two frequencies and at the same time they would not cause any mutual jamming. One more invention deals with wave processes in Earth's ionosphere; in popular explanation this discovery means that the field of the Earth reacts to electrical vibrations of given frequency in the same way as a tuning fork resonates with a specific wavelength of sound. These electrical vibrations can have a strong influence on the field of the Earth. Such resonant effects can be used in different ways - first to change the universal energy system, which is far from being perfect and has not used all its natural possibilities. Reproduction of photos and all kinds of drawings or hand-written texts with a possibility to send them across the world. Though development of modern science and technology mainly confirmed Tesla's predictions, it didn't match with them in a fundamental sense. Tesla wanted to realize all these things by means of transmission through the Earth, not from surrounding orbits. Due to the same reasons, which made him stand up against the use of nuclear (atomic) energy as dangerous for people because of their ignorance of the real structure of matter, Tesla considered that any infringement of cosmic space and of the magnetic field of the Earth is an infringement of harmony inherent in natural laws. In addition, there is a consequence of negative influence of people's free will, which becomes destructive in the absence of an ethical component in science. Free will can be creative only with kindness, which accompanies the higher understanding and conscious selection of positive intentions. He considered that humankind living on Earth should understand its natural alliance with the planet, otherwise people will be deprived of it. In 1892-1893 in London, Tesla read his famous lectures at the Royal scientific society of Great Britain. Together with the above-mentioned experiments, he demonstrated many others, for example, lighting of lamps by wireless transmission of energy. Really, he only placed a vacuum neon tube close to the field of a transformer and the lamp lighted. Due to these wonderful lectures ("Light and other high frequency phenomena"), Tesla gained a good reputation and got many friends among scientists - William Crookes, Sir Oliver Lodge and J.J. Thompson - Lord Kelvin. When he returned to USA in 1893, he got absorbed in problems of radio techniques, telecontrol and wireless transmission of energy at big distances without losses. He made successful experiments with direct electromagnetic field of the Earth and wireless transmission of energy at Colorado Springs. Though his diary of this period of work kept safe and was published, he didn't advertise his most important scientific results. However, all these achievements sparked his idea of a universal system of wireless transmission of energy and information. Planetary transmission should be based on such extraordinary inventions as Tesla's resonance transformer without an iron core and Tesla's Magnifying transmitter. Tesla expected a lot from his broadcasting transformer. It was a particular transformer made for exiting the Earth. By means of this transformer he made a very powerful electromagnetic discharge at Colorado Springs. This discharge exceeded atmospheric lighting and Tesla obtained electricity, causing more than two hundred lamps placed at miles around the laboratory to light up white-hot. For Tesla this was irrefutable proof that his concept of wireless transmission of energy (distant action) was workable. After an unusual night on July 15, 1903 when he fired the sky not only above New York but above all the vast area of the Atlantic Ocean, in 1905 Tesla suddenly left his laboratory without a clear reason and left everything untouched. As we know, he never crossed the threshold of Wardenclyffe again, never visited it and never appeared in this region. It was very strange, he didn't take any calculations, drawings or documents from this laboratory, no paper whatsoever. Recently there were some speculations that Tesla was the man who caused a strong explosion with strange consequences in Siberia, in the region of Podkamennaya Tunguska in 1908! It was considered that this explosion could have been caused by a meteorite, but not the faintest fragment of it was ever found. It is true that Wardenclyffe Tower was a success in the technical sense. Tesla passed energy through the Earth and could accumulate and discharge a huge quantity of energy all at once at any place on the planet. It fully confirmed the results of his work of many years of study of the Earth's properties as a medium for propagation of electromagnetic waves. Tesla didn't give us his own physical theory, but with his numerous experiments, he created the basis for a new understanding of electromagnetism based on resonance. He considered that the World is a uniform, continuous electromagnetic medium and that matter is one of the manifestations of organized electromagnetic oscillations described by mathematical algorithms. He considered that the law of resonance is the most general natural law, which overcomes time and distance, and that all relations between phenomena are established only by means of various simple and complex resonances, i.e. consistent vibrations of physical systems, mainly of electromagnetic nature. Finally, instead of Newton's integrals, Leibniz's differentials and Maxwell's theory as expressed in his field equations, Tesla used the simple mathematics of the Ancient Greek mechanical geniuses, mainly Archimedes, making an analogy between mechanics and electromagnetism. It is not possible to fully evaluate the significance of this method of thinking, which points directly towards a necessity of a full physical interpretation of elementary mathematical notions. Obviously, a study of Tesla's heritage is not only related with the history of physics. We shouldn't look for technological aspects only; its essence is in miraculous human creativity in science. We need to analyze Tesla's data relating to creativity which is at the base of the new physical and technical processes discovered by him. This may very well afford us access to new ways of cognition. It is important to understand Tesla's original method of scientific investigation and research and the scarcely explained relation to cosmic principles, which are implicit in the World of ideas. Tesla could create visual images quite as real as images perceived by organs of vision. It is as if he changed the usual direction of nervous impulse on the opposite direction, from brain to retina, eliminateing the external image and substituting a mental one. Tesla sent his impulses like from "inside". He called it mental laboratory. This was his main method of experimenting. He had an ability to transfer mathematical, abstract notions into mentally visualized images, giving them geometrical interpretation, and then transfer them into a form that could be physically realized as working models for the construction of a device. He "made corrections" and "adjusted" a device for operation in his mind. When later this device was made of wire or other material, it always worked. As Tesla said, there was not one case when such an invention didn't correspond to Nature, i.e. it didn't work when a physical prototype was made. His method was unique in comparison with other scientific intuitions. Michael Faraday, for example, like Albert Einstein felt a kinesthetic premonition in the moment it hit (it was pressure and motion in peritoneal region), he had some kind of mental stress in the moment when an idea appeared. Dimitry Mendeleev dreamed of the periodic table in three dimensions, colored with bright almost fiery red colors like in a prophetic dream. However, it happens very rarely, with few people and only at certain moments. Tesla was in this condition all of his life. He had been training for decades to maintain his spiritual and creative activity. Tesla was a man whose philosophy and axiomatics didn't belong to the modern world. We can attribute him to the epoch before Socrates, to the area of ancient philosophy. It was not an accident that he was born on the Balkan Peninsula. Antique civilizations appeared in the old days in the southern part of this peninsula. Probably, the reason is a different geomagnetic informational field, an algorithm which is general to the evolution of the neural structures of Pythagoras, Plato, Zenon and Tesla. Perception of Tesla's physics requires quite a different understanding of mathematics; to some extent it should be sacral in the spirit of Pythagoras. Pythagoras considered that numbers and subjects are really interrelated. They correspond to each other in some properties due to informational and mathematical aspects of matter's existence as a manifestation of the Divine Logos. Even a less attentive researcher can immediately notice that there are no infinitesimals or differentials in Tesla's works. Tesla said about James Maxwell, the creator of theoretical electromagnetism, that his elegant differential equations are poetry. One could find Maxwell's works in Tesla's library; these works were published when Tesla was twenty and he was a student in Graz. The only reason which allows us to explain why Tesla didn't use them is a very serious and deep one: he discovered a more simple and more effective way and a more felicitous physical interpretation of mathematical notions. By means of these notions he foretold the course and results of experiment. It is evident that he was a man of such strength and astuteness that he could keep his distance from the conclusions of what at the time was modern science, recognizing that its system of notions and mathematical apparatus were far from perfect. It is not by chance that he didn't uphold his diploma. It was an indication of spiritual independence for him, but not idleness or revolt as it can be sometimes. His method of work could have turned him to an absolutely different direction but that didn't happen. This proves that he could control the essence of his psychic visions and other conscious or unconscious manifestations that was the basis of creativity. When he felt the effects of impulses coming from outside, he could override them, he could control and analyze. He could do a seemingly impossible thing: by means of exercises, which he developed himself, he attained a level where he did not depend on impulses provided by the external world, but first and foremost on his own inner psychic states. The essence of his genius was in the fact that the things he understood and which appeared in his subconsciousness under the influence of an external field was a picture of cosmic processes or even natural laws. This made him distinctly different from other people. He said about the rotation of a magnetic field, where the rotor of an engine began to rotate under the influence of changes taking place in the external field: "Now I know how the Cosmos works". This is the source of his theory on people as automatons subject to cosmic forces. If we add Tesla's practically discovered axiom, that "the energy of a system is derived from its environment", then we will find the reason for his conviction that the entire Cosmos acts on the principle of vibration and resonance. Finally, if we agree with the fact that all energy of a system appears under the impact of external induction, it will be easy to understand Tesla's cosmological model as a series of circuits of magnetic fields, which rotate concentrically. Really, the Galaxy rotates, the Solar system rotates around the center of the Galaxy, the Earth rotates around the Sun and molecules, atoms and electrons also rotate... All this is a range of rotating magnetic fields, which can be described by the only one law, the same law that was responsible for starting Tesla's inductive motor. An open question is about Tesla's real understanding of time and space categories. We can say with certainty that in his research of how low frequency electromagnetic waves are transmitted through the Earth, Tesla did not deal with the problem of conjugacy of force and space, but general relativity theory (GRT), for example, did face this problem. GRT has some complexities in the physical explanation of differential equations, which describe the properties of curved space under the influence of gravitational forces of different power. According to this theory, a constantly increasing attractive force can influence time itself turning back events and violating the principle of causality. When Rene Descartes created his coordinate system, he used the same geometrical notion to picture abscissa and ordinate. They are two straight lines of indeterminate length, which he interpreted as time and space as if there was no difference between them. Is this possible? It is hardly possible. As you know, space and time are different physical categories and we hadn't understood their nature well enough. Besides, abscissa and ordinate are divided by an angle, which does not have a special physical interpretation. That's why if we are picturing physical phenomena in a geometrical way, we risk not taking into consideration the criteria of reality in checking of our mathematical hypotheses. There is no doubt that Tesla, by means of his physical research, discovered a fundamental physical law, which is not clear yet. He applied it so easily and with a such astuteness, that both an amateur and a specialist could similarly understand that he had an exact knowledge. But now it is hard to imagine the significance of these simple mathematical operations of division and multiplication, natural algorithm or square root taken separately, which are so important in Tesla's experimental work. The unequivocal physical explanation of mathematical methods is situated at the boundary, where we enter the field of transcendental mathematics. However, it is evident that if all physical reality can be reduced to the mutual relation of electromagnetic fields, then mathematics is a theory, which can express the essence of these connections most effectively. If electromagnetic oscillations correspond to the mental plane (the discovery made by Tesla at Colorado Springs is an experimental fact), then it means that mental plane itself should have the same nature and follow the laws of resonance. A conclusion arises that numbers are "programs" of organization. Tesla's research, as it were, proved the verity of Plato's theory of cognition. Plato stated that mathematics is a link between the World of ideas and the World of material phenomena. To be more precise, mathematical algorithms and mathematical logic is properly a method to realize ideas. Finally, all the old legends of prime origin teach that matter is only concentrated light, and it is Tesla's all-penetrating cosmic substance - the "luminiferous ether". Numerous accounts, a book and two movies describe an event in 1943, when the American navy made an unusual experiment to make one of its warships invisible. It was necessary to make the ship create a strong field around itself, using powerful magnetic generators. This field should be able to change the direction of light beams as well as to diffuse the radiation from radar sets and thereby hide location of the ship. The experiment took place as little as six months after Tesla's death and the disappearance of important scientific documents and apparatuses from his room. The event took place in Philadelphia harbor. When the generators were fired up, something unexpected happened. The strong electromagnetic fields changed local time-space coordinates and the cruise ship (Eldridge DE-173) disappeared for some time. Then the ship appeared for a few seconds in another place, i.e. in one of the biggest sea bases at Norfolk, south-east Virginia on the Atlantic coast, which is 350 km away from Philadelphia. The strangest things happened to the crew. Half of the sailors disappeared forever, some of them went crazy or got an ability to disappear and appear again by their own will. Part of the crew who survived, stated that they "have changed the world" and saw or even spoke to extraterrestrial beings. A thick greenish fog preceded the disappearance of the ship. This fog covered the body of the ship as soon as the strong electromagnetic generators were started, which produced intensive focused electromagnetic fields. Three ships took part in this experiment. The above-mentioned cruise ship was in the middle, the shell of the bodies of two other ships served as a mirror. Actually, the case in point is open "lasers", which do not need a vacuum. Such laser beams can be transferred at any distance and in any medium. Tesla produced such lasers in his New York laboratory even in the nineteenth century. He illumined the room without any lamps by luminescence of the air. Let's return to the significance of Tesla's experiments in Colorado Springs in 1899-1900 to see what are the real results of this work. When making experiments with ultra low and ultra high frequencies of electromagnetic waves, he obviously was successful in determining the frequency and type of modulation, which is provided by the energy fields of living people as well as dead people (numerous articles are devoted to this, but these articles are lacking a clear theory and contain some inexact suppositions). Most likely, he could create a field of ultra high frequencies, which corresponds to the resonance frequencies of disincarnate souls (a soul without any connection with the body) and thus he became proficient in visualization techniques of the so-called astral level of being for biological organisms. Calculations in Tesla's records could seem to be insignificant for modern specialist since they are very simple and cannot be understood without additional explanations. Only a mind which has a similar perceptive ability can understand Tesla's calculations. Tesla could reproduce complex energy structures in laboratory conditions. He called them "fireballs". The Russian scientist Peter Leonidovich Kapiza also studied them, but he could not reproduce them in controlled mode without Tesla's resonance transformer. Today physicists (the Corum brothers in America) reproduce some of Tesla's experiments with a certain success. They obtained very short-lived "fireballs" of only three millimeters in diameter. Tesla produced "fireballs" of football size, kept them in his hands, put them into a box and covered with a lid, and then took them again from the box. These fireballs were almost stable structures, which could be kept for minutes. Certainly, Tesla knew much more about this phenomenon than modern science; he knew the secret of cold plasma fusion in free space. Thus, Tesla entered a field which was unexplored before: time engineering technologies. He also emphasized that his electromagnetic waves were different from Hertz's waves; i.e. the length of wave transmitted by him is equal to the distance to which this wave is transmitted. In other words, it is equal to the distance between sending object and receiving object. Hertz measures and space measures are changing in opposite directions: one Hertz is taken as corresponding to the wave length of approximately 300 000 km, 2 Hz - 150 000 km, 3 Hz - 100 000 km etc., which means that real length in space is decreasing with number of Hertz's cycles which are increasing.... That is why Tesla did not count in Hz... Obviously, Hertz's measures are not adjusted to technical properties of the electromagnetic apparatus. Besides, there were not only the circuits of the oscillator (a device, which took part in the transference) in resonance, but the entire system was also in resonance with natural electromagnetic waves of the corridor of their passing. It meant that an oscillator, which started transmitting, almost "intercepted the ether" in the space between transmitter and receiver and in this way created a field of standing waves. Thus, a waveguide formed at first, which could not transfer any energy of its own. Then Tesla turned on a low-frequency field and transmitted waves of lower harmonic components of the main field carrier, in the ratio of 1:4. In such a way he could transmit energy at the desired distance and he could make strong continuous electromagnetic discharges in certain zones while creating a wall from ionoplasma. Nothing could penetrate such an energy wall without decay of its molecules or atoms. It is evident that Tesla knew the phenomenon that we can call parapsychology for lack of a better word. The method he used to make his discoveries or work in the laboratory has no analogues in the history of science. There are more that 150 000 documents in the Nikola Tesla museum in Belgrade, but he didn't leave any description of his scientific method, which is comparable only with states experienced by yogis or with things known by saints. Few people nowadays consider Tesla to have been a philosopher or highly spiritual. They do not think he was a man who inspired physics, technology and science. But in truth he laid the basis for a new millennial civilization with all his life and work. Although at present his influence on modern tendencies in science is minimal, his role needs to be revalued. Only the future will bring a real explanation of Tesla as a phenomenon, because he went far ahead and he stands higher even than the methods of science accepted nowadays. "This man is different from other western people. He showed his experiments with electricity. His attitude to electricity looks like an attitude toards a living being. He speaks with it and gives it orders. I speak about a spiritual person of the highest degree. There is no doubt that he has a spirituality of the highest level and can call all our gods. In his electrical multicolored lights, I saw all our gods: Vishnu, Shiva... and I felt the presence of Brahma himself". Resonance is simultaneity. If we change the periods of oscillation of an electrical circuit, then the geometrical picture of the magnetic field distribution will change and the generator is set in motion only under the influence of the temporal factor. Motion is a result of asynchronism. It is proven by the fact that it is possible to obtain a change in speed of the motor and thereby its mass without an additional impulse, i.e. without any additional force. Tesla's reversible magnetic field can be seen as proof of this. Tesla wrote from Colorado Springs to his New York friend Johnson that he found a thought in the "scribble" of high-frequency electromagnetic discharge and soon Johnson would be able to read his poetry personally to Homer, whereas Tesla would discuss his discoveries with Archimedes. We can also find a detailed description of "green" electromagnetic waves in his research journal. These waves looked like the fog which appeared when the warship in Philadelphia disappeared. When Tesla returned to Colorado Springs, he told journalists that he made a connection with extraterrestrial civilizations. Only few people regarded this claim as serious. However, there is evidence that Tesla continued his research on "parallel worlds" alone and silently, without giving publicity to the results. To all appearances, he made a device to tune the electromagnetic oscillations of his own brain, in other words, to control his mental activity. Thus, he could communicate with realities displaced in time (parallel worlds) without any problems. These researches open a new page in modern science. They show it is possible to merge material and spiritual aspects in human consciousness (matter and spirit in nature are already merged). Tesla had an ability to develop both directions of unified science. He studied the physical basis of the mind and the mental basis of physics with the same success. He came to the essential general conclusion that matter consists of organized parts, which are manifestations of ether in its excited state. One of these manifestations is electromagnetic oscillation. That's why the law of resonance law is a general natural law and it is also of temporal nature. A connection between phenomena is provided by resonances of different kinds. Electromagnetism is the basis for these resonances. Needless to say that if on the one hand, physical reality can be reduced to the interrelation of electromagnetic fields, then mathematics is a theoretical expression for these relations. On the other hand, if electromagnetic oscillations interact with the mental plane, which has the same nature, then numbers are similar reflections of the organizational structure of electromagnetic fields. I personally believe that mathematical and physical truisms, or rather geometrical and arithmetical phenomena, should join and become the basis of a uniform Cosmology. Now we should take into consideration that we are on the threshold to such a Cosmology. Somebody calls it a "New Science", but "Unified Science" would be a more appropriate term, because unified laws are at the basis of our Cosmos. In fact, Unified Science is the Science of Time. Tesla's electromagnetic theory was a vivid illustration of unification of the material and spiritual origins of the Universe. He produced a lot of practical results and it is perhaps due to this fact that he did not leave us his theory. Possibly, he could have left us a religion but he didn't want to do that since he knew that God needs conscientious followers in science. The famous writer Samuel Clemens (we know him under the pseudonym Mark Twain) often visited Tesla's laboratory. Tesla was very close to him and several years after Twain's death he spoke about him as if he were alive. The writer Mark Twain died in 1910, and his enigmatic novel "The Mysterious Stranger" was published six years later. In this novel, he told about an Angel who left the heavens and came to a small Austrian village. There he met a group of boys and let them into the secret of the universe. If we recognize the little Austrian village as Smilyan and the figure of the Angel as Tesla, then an explanation of a very strange theory of human destiny and cosmology will appear. This theory, expressed in this short story, made it to be different from other stories of this writer. The angel tells about the source of all people's troubles and misfortunes. Their cause is a misunderstanding of the true sense of sometimes very small events. Each of these events defines future links of the next events. He believed that people's free will is an illusion since everything is predetermined and will come to a principally predictable result. That's why the given human individual psychosomatic structure has a limited number of possible destinies (series of events) and a man can switch back and forth due to the will of higher beings. For example, The angel takes part in the event, when a person closes or opens a "window", which was predetermined for the person, so after this action the destiny of this person will go another way depending on the specific action, and this act will call a new succession of events. This entirely coincides with Tesla's idea of a man as an "automaton of cosmic forces" and it is brought out clearly by simple dramaturgic tools used by the famous writer. Finally, before the angel left his friends, he let them in to the last magic secret, which would be terrible to them, i.e. the secret of Non-existence. He said that all is only a thought. There is nothing existent... "I am only a thought, a lonely thought which travels along the empty space of the Universe". Let's visit Tesla's laboratory in Colorado Springs again, where the inventor made his experiments using electromagnetic fields of high frequency. He studied the operation of the human brain on himself. He wrote to his fellow Johnson about some intelligent properties of electromagnetic fields. The biophysical principles of neurology were born. Just after this, in 1901, construction on Long Island began. It was to be a complex transmitter of electromagnetic waves. Tesla applied all his knowledge to design it. The principles are: teleautomatic control, Hertz's wireless wave transmission, unique ether theory, according to which any natural element of Mendeleev's system has its own gravitational acceleration and Tesla's techniques to control the speed of the course of time. A new physics was born. The question is what concept of the World was at the base of this experiment, focusing magnetic and electromagnetic fields using the principles of resonance. Let's return for a moment to the mystic Monard and his picture of Cosmos. Speaking about vibrations, he underlines the presence of different nations, races and tribes on the planet, but we cannot find people who lived without music and dancing. Even 2500 years ago Pythagoras said to his progeny that a stone is "frozen music". Every particle of the physical Universe has a certain property, which is pitch and the pitches of its separate frequencies, i.e. its melody. The nature of influence of music on a person is the same as the nature of its influence on the world of things and events, because vibration is the basis for all. Frequency of vibrations of subatomic particles is very high and waves in the center of subatomic nucleus move quicker. Vibrations of all radiant energies (radio waves, heat, light, X-waves and so on) could be ordered. The electromagnetic spectrum contains more than 80 known octaves and visual light is only a part of this extremely wide range. Electromagnetic waves as acoustic waves in music have their own harmonious high-pitch tones and there is some kind of octave principle, i.e. a doubling of the frequency. Laws of music and harmony applied to electromagnetism give splendid results. That's why Nikola Tesla used the works by Herman Helmholtz on sound to develop his electrical resonators. Johannes Kepler, an astronomer, who lived in seventeenth century, believed that every planet of the Solar system is alive and there is a guardian angel on every planet, which listens to its music. Planets "play music" on their circumsolar orbits. A particular combination of sounds, which we call music, is an expression of relation between things, in other words, their likeness and difference. It is also a principle of appearance and disappearance of phenomena as well as the principle, which shows how new young systems grow from coordinated harmonious systems. The deep inner structure of music is the same as the structure of all the rest. The Dutch scientist Christiaan Huygens in 1665 noticed that pendulums of two clocks that hang on the wall near each other, start to work in rhythm. It is a universal phenomenon. When two or more oscillators begin to pulse with sufficiently small difference in time (with a small shift in phase) their oscillations spontaneously converge to eventually coincide. They behave according to the principle of minimum energy since every separate pendulum requires a smaller quantity of energy with synchronous pulsation than in the case of arrhythmia. This co-ordination is everywhere, but we rarely notice it. We can say that all animate things are oscillators, which pulse and change their rhythms. Even the simplest unicellular organism is in a complex oscillatory state. All motions on the subatomic, atomic, molecular, subcellular and cellular levels are coordinated. In such an organism, like in the human one, it is very difficult and even impossible to determine corresponding parameters. Our inner rhythms are closely interconnected and they are coordinated with the external world. The physics of a man and his states on his rarified (astral) plane change in rhythm with the Earth's movement around the Sun, with ebbs and flows, change of day and night and with many other cosmic rhythms. When there is a lack of coordination between these rhythms, the organism feels discomfort and even a presentiment of near illness. Our physical body serves as an exponent of our inner leading pulse and at the same time, it is our individual distinction in the Cosmos. The so-called "fine body" essentially has an electromagnetic material base. Our lives are characterized by a certain rhythmical scheme, which is subject to physical death but there remains an extra-body experience of the spirit, which may be reincarnated. There is a supposition that the so-called "Schuman waves" are present in the telepathic transmission of image and thought. These are waves of 7.8 Hz frequency, which form a field of standing waves in the space between the ionosphere of the Earth and its surface. It may happen that a brain enters a state of resonance with some external structure; a result will be the appearance of its image at a distance, i.e. there is a contact made by means of resonance but not by means of radiation. Since these waves have a big length (38 000 km), then transmission takes place instantly. Waves with such an extreme low frequency cannot be screened by usual means. In essence, waves of an organism often coincide with these waves by phase. However, the problem is that waves with such low frequencies can transmit quite little information and therefore it is often impossible to receive a clear picture and give a full description of images of things perceived in this way. The modern holistic (integral) approach to understanding the Universe has sacral traditions per se. These traditions were built into the foundation of many religions, such as Judaism, Islam, Buddhism, Christianity, where we can find a clear statement that every part of the Cosmos includes the whole. This is analogous to the principle of holography. It is considered that we can make a full hologram of the Universe based on any of its small parts. Formation of this hologram can take an arbitrary length of time. A hologram of a real man is something different from the physical basis of the ideal cosmic rhythm. Consciousness, which is a continual manifestation of the rarefied substance (astral) of a person, is shifted by its phase in comparison with genetic material, and our conscious will is only one of a universal instrument of cosmic purpose. A "right" person acting in a "right place" is someone whose intentions are coordinated with cosmic rhythm. Conscious intention has a great power, and our main choice is to take responsibility for its results. So, actually we are made of waves, not of matter which could be called "solid". What we call things and events are manifestations of the action of these waves. Every person has a unique cosmic identifier assigned by a certain function of waves, which represent us. Every person has their own hologram, which contains universal information about time. The identifier is a main element of the Cosmos that characterizes the individual specificity of a person, who is using this identifier. By means of this element the person can influence everything by methods, which may seem to be unusual. We are a peculiar hologram, so potentially we know all about all. After these general statements, let's remember about Nikola Tesla. The secret of Wardenclyffe is deeply hidden, and it is impossible to speak about its real destination now. Nevertheless, many things indicate that the object built by Tesla on Long Island (a New York suburb at the time) went ahead of all dreams of modern scientists. It was a transmitter of an electromagnetic wave system, which could be easily controled. By means of these waves that scientist caused earthquakes, "mental" shifts in people and animals, fired the atmosphere, made impenetrable energy barriers in the ionosphere, controlled time, split and condensed the clouds by means of corresponding frequency of waves and, finally, he obtained an inexhaustible supply of energy from the ether using a principle of "ether technology", which is still unknown to us. The great Master Tesla demonstrated his experiments to numerous witnesses, but he never announced all the results or initiated anybody into his scientific principles. The real reasons for building this giant electromagnetic and mechanical oscillator were perhaps much more serious motives than we can imagine. "Last year in the beginning of December we got a telegram from Lowell observatory at Arizona. This telegram informed that a strong light flux was noticed coming from Mars which lasted for 70 minutes. Lowell observatory specializes in observations of Mars, and the observer was an attentive, approved and experienced man, so we have no reason to doubt his statements. We will consider these facts immediately and will notify Europe and America via telegraph. The light came from a known point on Mars and there is nothing unusual in this point according to scientific data. Whatever there was, at this time we have no means to research anything. We cannot say with certainty if it is a sign that there is intelligent life. For the time present this phenomenon is inexplicable." When this information appeared, Tesla was in New York. He had just returned from Colorado Springs, where for a year he had made epochal and inexplicable experiments with electromagnetic fields of strange resonance properties. (Tesla's laboratory in Colorado was situated on the summit of Pike's Peak. It is interesting to note that the Hopi Indians deified this peak. They consider it a Spiritual Pole of the World). "I'll never forget the first feeling that I felt when I understood that I have a contact with something, which will have priceless and immense results for all humankind. The thing that I noticed frightened me, as if I saw something mysterious and almost preternatural. Little by little I understood that I am the first to hear messages being sent from one planet to another..."
Professor Holden, a respected scientist, rejected Tesla's account of contacts with extraterrestrial beings by means of electromagnetism, he thought it was not serious. Tesla worked with some extremely long electromagnetic waves of very high frequency that do not correspond to accepted theory, because increase of wave frequency is always related only with short-wave transmission. However, Tesla's waves were different from those discovered by Hertz. They traveled with a speed that far exceeded the speed of light, in what could be said to be instantaneous propagation. Tesla has his own theory of electromagnetism, which still is not fully interpreted. He discovered not only the possibility of wireless transmission of energy through the Earth and atmosphere without any losses, but he also proved an unprecedented "breakdown power" of these waves in spreading through space. There is an unconfirmed legend that Tesla was the first who sent periodical signals to the stars. There was coded geometrical information like theorems by Tales, Pythagoras, and an Archimedean formula of a harmonic series (we speak about addition of the series 1+1/2+1/4+1/8+.... The sum of this series is equal to two but number of terms can be infinite). Three days later Tesla was surprised to get a response. He guessed the underlying principle of the response code, and got a human face with regular features. At first he couldn't understand, if those who made this picture and sent this signal demonstrated that they knew our civilization, or they drew their own image to demonstrate that there are similar beings in Cosmos. If this is true, then it should be clear why Tesla refused to engage in any open discussion of this discovery. He simply couldn't get a proper response. But soon something occurred that re-ignited discussion of this problem in the American press. In 1902, the famous English physicist Lord Kelvin visited America. When he spoke to Tesla, he expressed a full consent and understanding of the fact that details of Tesla's "extraterrestrial communication" were not for public discussion. After the banquet organized in his honor, Lord Kelvin said some good words about New York: "It is the city with the best illumination in the world and it is the only place on the Earth, which can be seen from Mars". In addition, as if by some kind of inspiration he finally exclaimed "Mars is signaling New York". This time nobody had objections. Even the eternally critical Professor Holden kept his silence. It was not polite to contradict such an old and respected man as Lord Kelvin. Instead of objections, an article written by the writer and publicist Julian Hawthorne, Tesla's associate, appeared as a direct conclusion from this discussion. He described Tesla's sensational methods as a phantasy. Hawthorne wrote: "It is evident that people from Mars and other old planets had been visiting Earth for years and attentively observe the development of our civilization. Besides, Tesla's birth changed everything. Perhaps people from the stars control his spiritual and scientific development. Is there anybody who can know something concrete?" In the heat of the disputes concerning Martians, Tesla was alone in his Tower and continued to work hard and without distraction on the biggest project of his life, Wardenclyffe Tower to bring about radical changes in the development of our civilization. These changes cannot easily be considered in a serious way. When he made a decision to build a transmission station, Tesla first bought a plot on Long Island and then asked the famous manufacturer Morgan for help. Morgan was a member of numerous secret organizations; he was also a genius of business organization. He already had cancer and had a hope that Tesla's science would help him recover. 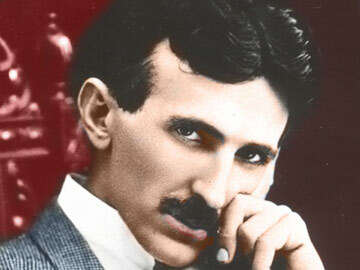 He expected that Tesla somehow would connect him to some vital energy source and would make him young and healthy forever. Tesla thought that Morgan was a man who would keep his word. He considered that a man has predestination of his life collisions and every man is predisposed to his own activity. The negotiations between the two old friends were private and hard. There is no clear information about the time when Tesla decided to begin the construction of the Tower and about the expectations of Morgan as an experienced businessman. "What I contemplate and what I can certainly accomplish, Mr. Morgan, is not a simple transmission of messages without wires to great distances but it is the transformation of the entire Globe into a sentient being, as it were, which can feel in all its parts and through which thought may be flashed as through the brain..."
Many authors, especially Tesla's biographers, blamed Morgan for a reduction of financial assistance at the moment when Tesla was already on the threshold of very important discoveries, when it was necessary to finish and start using his masterpiece, Wardenclyffe Tower. But Tesla clearly tells us about it in his autobiography. In spite of all that was said, Morgan fulfilled all his obligations to him. "My project was retarded by influence of natural laws. The World was not ready to accept it. It was too far ahead of time. But the same natural laws will prevail in the end and the project will be repeated with a triumphal success." "Night suddenly turned to day. Sometimes the air was full of luminescence concentrated along the edges of the human body, and all people radiated a mysterious shine. They seemed to be as ghosts." 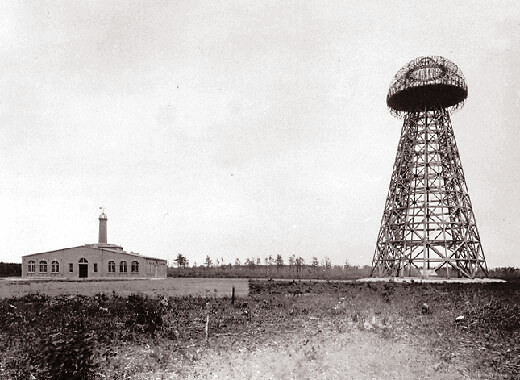 According to Tesla's initial plan, five towers, the same as Wardenclyffe, were to be built. The second tower should have been constructed in Amsterdam, the third in China and the fourth and fifth were to be built on the North and South Poles. However, this plan was postponed due to reasons that should be investigated. However if, finally, all this could be realized, then what would have been achieved? The Earth would have become a uniform homogeneous system, which could be controlled by transmission of commands starting certain oscillators, which would produce and transmit electromagnetic waves of various frequencies. That electromagnetic system should then have been completed with a system for mechanical resonance with the Earth. These systems consisted of a tunnel dug under the laboratory and filled with water and oil, where hydraulic pumps served as oscillators. By synchronized actions, based on exact mathematical calculations, both systems could start vibration simultaneously, the rarified stratosphere, ionosphere and atmosphere as well as the liquid and solid structures of our planet. "people who live near Wardenclyffe and who were frightened by my experiments could see much more... if during the last two years they were more awake than asleep they could have got acquainted with really incredible things. Sometimes, but not now, I shall announce something, which you cannot find even in fairytales." After that unusual night, when he fired the sky above not only New York but also above all the vast area of the Atlantic Ocean during his experiment, Tesla suddenly left his laboratory without a clear reason and he left everything untouched. As we know, he never crossed the threshold of Wardenclyffe again, never visited it and never appeared in the region. It was very strange, he didn't take out of the laboratory any calculation, drawing or document, no paper. It was a turning point in his public scientific work. He was living for 40 more years and was continuously working, but he patented only his mechanical discoveries and published only articles in newspapers. Tesla discovered the laws and fundamental properties of the Ether, and he made use of what determines the structure of the initially infinite and homogeneous ether. Supposing that the ether is continuous and is the principal cosmic medium, it becomes clear that the imaginary "center" of the Cosmos is everywhere, and that the law of structuring such a medium should have analogues with the law of location of points on the surface of geometric spheres. There is no information that Tesla formed and told his theory in such a way, but he left us some systems working on principles which are unknown to modern physics. We refer here to the ether generator, i.e. electromagnetic ball, which has constant electrical potential in spite of energy leakage, as well as a synchronous motor working on gravitational waves of the planets of the Solar system (this motor turns on independently at the certain seasonal times and reacts to specific arrangements of the planets. It also independently turns off, when the interval of time of optimal resonance ends). Tesla also designed a metal disk, which could levitate at some height and has antigravitational properties, which do not depend on gravity force of the given place. Parts of the structured ether can be in resonance or not. In the first case, a condensation of subatomic particles such as electrons, protons and neutrons takes place. These particles appear by means of resonant synthesis of photons, according to the same principles as during formation of photons as specific particles of the ether. Asynchronous, non-resonant parts of Ether form a space, in which resonating photons form matter. Tesla's Wardenclyffe Tower was a " Pythagorean" oscillator. The mathematical description of transmission of particular electromagnetic waves was identical with the Pythagorean creative method. Signs used by Tesla in his equations have a single-meaning physical interpretation. The principles of Tesla's ether technologies belong to the level of cosmic existence, where it is possible to control space and time. The principle of resonance and harmonic oscillation of the ether seems to be so clear that all problems of modern physics, especially problems of energy conversion, will be solved with its development. By means of his vacuum tube Tesla obtained protons, electrons and neutrons directly from the physical continuum (ether) and reproduced them at any distance. Instead of providing for a bundle of protons to move freely through space to some place, he created the conditions for the immediate appearance of an arbitrary quantity of particles in the given place. The quantity of protons, neutrons and electrons was unlimited and the difference in their quantity was stipulated by creating a shift in time. Editor's note: Modern physics knows how it is possible to create mass particles, for example, an electron-positron pair, from the physical vacuum, but they can not do it without the huge energy source of a beam accelerator. Tesla's resonance method shows us the way to unlimited free energy sources by means of structuring of the vacuum. The first step to this technology is developing a theory of and doing and experiments with longitudinal electromagnetic waves. In reality, the theory of acoustic resonators is already well known. All we need is its application to electromagnetism. Supposing that Tesla knew some laws of nature that are unknown to contemporary science and may still be considered inconceivable, we should think about what technical goals he followed using his Wardenclyffe Tower and what consequences he expected. 1. To induce oscillations in the ionosphere. Since the difference of voltage between the surface of the Earth and the ionosphere constitutes about two billion volts, then the Tower would be continually oscillating in the upper and lower harmonics of the oscillations of the ionosphere, up to full coincidence with it by phase (up to resonance) and could then discharge it in the same way as normal electrical condensers are discharged. Since such a charge could pass instantly, there would be a real threat to New York. A high-energy plasma column of a very big diameter (possibly of several hundred kilometers) would appear from the ionosphere, and everything situated in this space would be disintegrated. Of course, Tesla had no intention to destroy New York. He only wanted to take energy from the ionosphere by means of short oscillatory intervals to recharge his huge oscillator, which required a maximum voltage of one hundred million volts. As a system for inducing hyperfine oscillations, Tesla used a huge quantity of ultraviolet lamps, placed at the top of his Tower. 2. To take energy from the Ether. It is possible to shift the time coordinates and produce an energy transmission by time cycles from the Past to the Future without violating the electromagnetic equilibrium of the environment, using the oscillations of non-resonant electromagnetic fields. Of course, this should be done strictly following mathematical law, which determines the interrelations of frequencies with great accuracy. Otherwise, the results can get out of control and unexpected destruction of material and biological objects or their momentary drop out from segments of our reality can take place like in Philadelphia. 3. To open temporary windows in "parallel worlds". Since parallel worlds have an electromagnetic structure with a wavelength and frequency of oscillations different from those of the Earth, then it could be possible to make some connection between frequencies of oscillations of our world and those of other worlds by means of complex harmonic oscillations. Due to this, some pictures of these worlds could become apparent in our earth environment (and vice versa). 4. To accelerate human evolution. If we make a permanent high-frequency field harmonizing with the collective electromagnetic field of people, then little by little it will be possible to achieve an increase in sensibility of perception and an increase in ability to receive ideas. But radiation of these frequencies could be harmful since any disharmony of this field (non-resonance states) causes a partial separation of astral and physical substance of a man, it can lead to illness (for example, cancer) or mental disorders. Full separation of one substance from another, of course, leads to death. In addition, all these processes act slowly. Due to their lack of knowledge, people pollute their electromagnetic environment more and more by radio waves, microwave radiation from locators - now cell phones - (which cause cancer, as was proved experimentally). Other electromagnetic radiation also has negative impact if these electromagnetic waves are in disharmony with frequencies of oscillations, which are natural for vital functions and for the informational field of the Solar system. 5. To be able to transfer planet Earth into "parallel realities". If Tesla had finished the construction of his system made of five transmitters and start it, he could made the whole Earth oscillate as a uniform resonance structure on a level of oscillation which is peculiar to some other reality, and thus physically move us to that "parallel world". Thus possibly, he wanted to accelerate evolution of civilization. However, this could also be very dangerous, because if the Earth entered the state of resonance oscillating with "parallel worlds" and it took a long time, then catastrophes could occur like the one described in the myth of Atlantis. Modern experimenters should keep in mind that the secret of the physical world lies in metaphysics and as long as our science will be blinded with research of "crude" matter only, we will be in a state of illusionary split consciousness. It is necessary to provide a breakdown of human consciousness, and it will happen in physics. We should free the human mind and adjust it to deep cosmological research. Ethics is a cosmic principle, which contributes to energy distribution, isn't it? Thus it can obtain the status of natural law. And we will then be able to explain to the supposed habitants of other worlds, which are shifted in time, why we can exert an influence on the Galaxy and stars by means of special reactors and why we take part in experiments, which directly change us. If the essence of ethics is a harmony and kindness is a state of energy equilibrium, then mathematical, cosmic ethics certainly acts in the world. It is impossible to violate mathematical laws. "There is no king's way in geometry" - said Euclid to king Oedipus, who worked on the solution of a difficult geometrical problem. The cosmos itself seems to be a big experimenter. Our mind asks it questions, which are clever or not. That's why every true philosopher and scientist should reject applied science that grows from defect and rigid theory, when studying anything concerned with cosmic phenomena. The evolution of Tesla's philosophical positions begins with the oracular and finishes with engineering, then beginning from engineering, it finishes with metaphysics. Just as Tesla's private life, these are all milestones on the way to the formation of a new paradigm for a scientific and technical civilization. His attitude to people and himself is a result of the transpersonal absolute manifested in him. He had no personal attitude to anybody including himself and that's why he made few mistakes during his life. Tesla is often cited in modern science. Scientists who didn't notice contradictions of Maxwell's electromagnetic theory until now, have begun to study Tesla, especially those who work on unification of electromagnetism, gravitation and strong and weak interactions. Is it true that matter is infinitely divisible or not? Can space be divided infinitely? Finally, what is the role of time in physical processes? Maybe time is only a measure, a normal coordinate, as it is supposed in modern physical theories based on relativity and quantum mechanics. Tesla's ideas about ether as a basic medium, which structurally joins space and matter, were rejected. This led to stagnation in physical thinking and scientists have been continually returning to outdated ideas. Those scientific circles which take the risk of creation of a "new physics", Tesla's concepts now become increasingly valuable and they are studied. There are experiments with ultra low and ultra high frequencies of oscillations, which have specific modulation and form the radiation of the ionosphere. All possible consequences of these studies are still unknown. This includes control of meteorological phenomena, especially hurricanes and atmospheric pressure, infusion of thoughts at a distance by means of electromagnetism, i.e. resonance with electromagnetic transmitters. It becomes evident that it is technologically possible to imitate the external electromagnetic manifestations of human thinking. This is the position of Tesla's cybernetics. "A man is an 'automatic machine' of cosmic forces" - underlined Tesla in his main articles and lectures. Experimenters say that it is easy to excite mass emotions of people by means of corresponding oscillation of ionosphere, which includes harmonics of the collective subconscious state of all humankind. The ionosphere is a key to control mass feelings and thoughts. Tesla understood all this already as far back as 1899, living in Colorado. Modern university science and in particular the Serbian scientific community reject Tesla's ideas mainly because it cannot understand them. The second reason is the opposition, which Tesla demonstrated to nuclear physics, and his prediction that application of this technology would not be continuos and that quantum mechanics has no serious scientific future. "A man who keeps this religion in himself, feels strong, works with joy because he feels himself as a part of universal harmony." Not only physicists, who continue Tesla's work, but all people who ponder scientific problems, are agreed that modern physics is really a contradictory system of knowledge. On the one hand, time is relative and depends on the observer. On the other hand, it is stated that the time of quantum transfer cannot be measured. Nuclear reactions are studied as part of the of history of physics. In the course of these reactions, transformation of matter into energy goes without a residue. In astrophysics, full transformation of matter into energy is not possible. It is known that mass calculated as an effect of the force of gravity differs from the mass calculated from the speed of rotation of the stars around the center of the Galaxy (we can get it by means of "Doppler's" shift of lines in the spectra of their radiation). Therefore a significant defect of visual matter or mass can be found, and it amounts to 90%. Instead of changing the theory, scientific schools speak about "defects of mass". Tesla worked on a special "vacuum tube with an open tip", which served to transmit particles at any arbitrarily large distances. The targeting was done electrostatically by using lines of electromagnetic layers of the atmosphere, which can be distinguished by the naked eye. It is the layer where clouds float. It became known that the multiphase system, inductive motor and generators of alternating current are some of the less significant of Tesla's discoveries. The most important should be those which relate to his experiments with ether and time. We emphasize that they are harbingers of a perfectly new cosmological physics, which is based on electromagnetic resonance of the ether and on resonance effects of time. Tesla's most important discoveries are the following. The first is transmission of energy at any distances. Really, it is a superconductivity of natural environments. The second one is "fireballs" (synthesis of structural elements of ether and matter), high-frequency resonance oscillator adjusted for waves, which are different from Hertz's waves, waves with the so-called longitudinal modulation. It is a kind of free choice of consciously selecting electromagnetic units, which initially and in an elementary way codify the workings of the electromagnetic field of the human brain, modulate brain oscillations or change their nature. This may lead to various emotions, changes in consciousness, creative impulses, super perception and even to super cognition. The third one is the dynamic nature of attraction, in which every element of the periodic table has its own constant of attraction; in this case Tesla continued the works by Etvesh and derived several universal methods. And finally, Tesla's electromagnetic theory. This theory was not explained or published. This theory does not use the generally accepted notions, such as "energy", "wavelength", and "frequency". Instead, this theory introduces the notions of "distribution curve", "vibration of spiral systems", "electrical pressure", "proportion of transmission", "ether", "dynamics of electromagnetic fluid", "geometrical abilities of tube" and so on. Out of the modern mathematical arsenal, Tesla only used Fourier's ranges to separate electromagnetic oscillations into higher and lower harmonics, since it matched his main supposition on simultaneity of action of all parts of the infinite ether. It is clear that infinity cannot be formed with nonsimultaneous parts. Tesla's cosmology is a cosmology of a general type, which relates to an isotropic and infinite Universe. At the same time, Maxwell's electromagnetism can be applied only at comparably small distances. In general, Maxwell just made a mathematization of Faraday's experiments, but he didn't build a final concept around this problem. Due to the incompleteness of Maxwell's theory, great difficulties appeared in Special Relativity Theory (the interrelation of speed of propagation of energy and speed of light). Einstein himself ignored relativist changes of space-time with motion in the photoelectric effect, if energy changes together with speed, then there is no effect. The energy equivalent of the electron trajectory (knocked out by the photon) would be absent. In general theory of relativity, shortcomings of Maxwell's theory led to an idea of "world line" (in essence, it is a pancosmic extrapolation of magnetic force lines, which are visualized by iron filings on laboratory tables) and, finally, to the notion of a finite Cosmos, which alternately shrinks up to a "point", located out of dimensionality, or explodes... an unlikely development. It would be surprising not only for Tesla, but also for many antique philosophers and scientists, Pythagoras, Plato, Euclid and others. Nikola Tesla and his science are very significant for the modern world of telecommunication systems and as a way out of the crisis of our scientific and technical civilization, which is in needs of a philosophical ontology. During hundreds and thousands years, we have had many great scientists, but nobody had a temple built in his honor. Such a temple was built in California, in San Diego, in the one of centers of world scientific and technical power. Neither Plank, Einstein, Bor, Pauli, Torichelli nor Newton, in spite of their interest in alchemy, theology and mysticism, none of them could convince people of transcendental significance of their scientific views. Christian civilization is based on suffering, sacrifice and atonement of Christ, on the mystery of christening, resurrection and the world of afterlife. It is full of human feelings and emotions. The technical era under the sign of Tesla is a humane symbol of the unity of spirit and matter and it establishes not a religious belief, but a belief in scientific principles, and lets us discern fundamental laws of the Cosmos. Historically, Tesla radically changed the form of religious belief on a planetary level. That's why he is not only a scientist but also a universal and historical phenomenon of a higher level. He led us from the spirituality of theology to the spirituality of science. Besides, modern physics already became a philosophy of new times, since it openly works with the structure of matter, genesis of the Cosmos and, recently, Ethics. Quantum mechanics of the Copenhagen circle around Bor, Heisenberg and Pauli does not provide an answer to questions about the structure of the principal unit of matter. The theory of relativity doesn't solve the problem of the substantiality of time and doesn't explain the essence of the force concept. Tesla's physics, related to real physical space or ether, and his scientific thought, derived from positions of antique cosmology and Pythagorean mathematics (not from the electromagnetism of the twentieth century) couldn't be continued as long as there were limits preventing the creation of a general physical theory, which includes events of physical reality. After Chernobyl all people understood that nuclear reaction is nothing more than irresponsibility without real understanding of the structure of matter. And the tragedy of the Challenger space shuttle reminds us that humankind still does not have enough experience in long space travels and that jet engines cannot solve the problem. It is better not to even speak about medical aspects of interstellar travels. Tesla's physics gives answers and instruments to use in cosmology. Sometimes a notion that we use to denote some physical phenomenon didn't exist in Tesla's times. The same is true for the method of introduction of mathematical symbols to make calculations. Julius Mayer never used the word "energy"; Archimedes and Galileo calculated by mathematical methods but had no signs for calculations, which can be used today; Newton, who opened infinitesimal quantities, nevertheless made all his proofs by means of geometrical symbols as well as Euclid and all the other scientists who lived in the period between them. To understand Tesla it is necessary not only to read his works in the original, but also to explain the meaning of terms in his scientific understanding, especially the ciphered part of his archive, where the same notion is used in different contexts and may have several senses. Tesla's theory cannot be understood without a clear hypothesis and method of thinking, which is similar to his own. Advanced modern science gradually begins to study Tesla's heritage. We do not speak about commercial or university aspects of scientific knowledge, but about summits of scientific thought unknown to the wider intellectual community, about the separate nods of the net of the worldwide global informational space for humankind, in which everybody is connected with the others by the channels of the planetary telecommunicational net. This connection is made by two main coincident parameters, conformity of ideas and intellectual level. However, the thing that joins all is a subjective comprehension of Time as the basis for a new civilization. All early civilizations originate only from their understanding of Space. According to Tesla, in the planetary community of the future, all energy will be taken from inexhaustible and free sources. He pointed out that the Earth is a core (kernel) of a huge generator, which in rotation creates a difference of potentials equal to billions of volts with a slowed ionosphere, that humankind really lives in a spherical condenser of large capacity, which continuously self-charges and self-discharges. In this condenser, the ionosphere is a "phase", the atmosphere is a "dielectric" and the Earth is "zero". Thus, a global electrical process proceeds on our planet. Electrical energy does its work and then returns to the natural environment of planet Earth. There are linear "accelerators" invented by Tesla in the form of open vacuum tubes, i.e. tubes working at room temperature without energy losses, which get "targeted" by using the electrostatic properties of the "target" itself; that's why it is possible to transmit any quantity of energy at any distance by means of induction. Kenneth Corum, who repeated some of Tesla's experiments in America and achieved some results, still didn't understand the essence: Tesla's "particles" do not travel in space as other known particles or Hertz's waves, but they are self-generating from the inductive field like "fire balls". This is according to an original theory of Tesla, which is related with cosmic radiation and was proved by him experimentally. Tesla's reversible magnetic field has a universal significance. It is a mathematical idea, which is realized directly in every echelon of cosmic existence. I make bold to state that even Tesla's inductive motor, the so-called asynchronous motor, is not studied enough in a conceptual sense. There is an undiscovered mystery of the rotation of heavenly bodies and rotation in general. Acceleration of motion of "Tesla's egg" is based on the change of geometrty of the field, but not on the properties of magnetic induction (action at a distance) or on an increase of force (electricity input is permanent). Among Tesla's many mysteries there are several unstudied ones: in radio engineering there are some transmissions on the same frequency, which cannot be jammed (Twenty unused patents); in the structure of matter ("I used to split atoms, without releasing any energy" - this is Tesla's statement of 1933); concerning the force of attraction there is a model of a gravitational motor with tin rotor and glass stator working once a year under the influence of a certain planetary alignment; in the theory of the ether (matter is structured from ether and dissolves in ether again following simple mathematical laws, but if the generated energy is more than what disappeared, then cosmic catastrophes take place); Tesla's medical devices and the influence of low-frequency waves on the brain's operation, which causes contractile motions and a change of subjective "second". "Really, we are something different, we are like waves in subjective time and space, and when these waves disappear, nothing remains of us. There is no personality. We cannot say that waves in the ocean have individuality. There is only an illusionary sequence of waves, which go one after another. We are not the same that was yesterday; I am only a sequence of relative existences, which are not quite similar to each other. This sequence is that thing, which creates an effect of continuity, like a movie, but it is not my subjective and mistaken understanding of my real life." I cannot imagine Tesla smiling. I see him to be sad, since I see what a man could draw, when he gave all his essence to the power of natural laws. 1856 - on July 10, at the midnight Nikola Tesla was born in Smilyan, in Lika (province of Austrian monarchy) in the family of a Serbian priest. 1875-1878 - he studied in the Polytechnic Institute in Graz (Austria-Hungary). 1882 - in Budapest, having been walking around the park, Tesla made a discovery relating to the reversible magnetic field. 1883 - in Strasbourg he was employed in Edison's Continental Company and built a model of the first inductive motor. 1884 - he left for New York and began to work in Edison's laboratory. 1885 - he left Edison, established his own company and started to produce motors and generators of multiphase alternating current. 1888 - on May 16 he gave a lecture in the American institute of electrical engineers on the topic "New system of motors and transformers of alternating current". 1890 - he announced his results on the physiological influence of high-frequency electricity. 1891 - he gave lectures on the topic "Experiments with alternating current of very high frequency and its application in artificial wireless lighting"; registered patents of "spark oscillator with resonance transformer". 1892 - he came to London and read lectures in the Royal scientific society on the topic "Light and other high-frequency phenomena", in the Institute of electrical engineers he read lectures on the topic "Experiments with alternating current of high voltage and high frequency"; then he gave the same lectures in Paris. 1893 - he attracted public attention at the World Exhibition in Chicago. He passed a high-frequency current through his body and demonstrated a model of reversible magnetic field, the so-called "Tesla's rotating iron egg". 1895 - on May 13 Tesla's laboratory in New York was destroyed with fire. 1897 - he registered twelve patents in radio engineering. 1898 - registration of the patent for teleautomatic control (experiment with model ship on the lake in New York, Central Park. Tesla demonstrated wireless control of the ship and astonished all witnesses). 1899 - construction of a hydroelectric power station at Niagara was finished. 1899-1900 - experiments in Colorado Springs. 1901-1905 - construction of Wardenclyffe Tower on Long Island, near New York. 1909-1922 - he registered patents only in mechanical engineering (pumps, tachometers, bladeless turbines). 1943 - on January 7 Tesla died in New York, in the "New Yorker" hotel. At first, a burial service was read according to Orthodox tradition, and then his body was burnt according to Buddhist ceremony. The Teslascope was a radio transmitter designed by Serbian scientist Nikola Tesla with the intention of communicating with extraterrestrial life on other planets. It received publicity after Tesla's statement on the device was published by Time magazine in their July 20, 1931 issue celebrating Tesla's 75th birthday. Over the past few months, several revisions have been made to the Tesla Dictionary of Advanced Research Terminology. As you probably know, the original edition was published by the International Tesla Society in 1996. It is currently available at Onelook.com and as an HTML page at the Tesla Academy site. One illustration has been included in the new file. If that works out, several more can be added. Your comments on definitions and suggestions for new entries will be appreciated. THANKS FOR THIS ARTICLE ON TESLA, SEPP...... I COULD NOT SLEEP TONITE DUE TO VISIONS OF TECHNICAL AND MUNDANE PROBLEMS TO BE SOLVED IN THE REAL WORLD OF TOMORROW. THE ARTICLE IS A COMPLETE VALIDATION OF MY OWN METHOD OF CREATING NEW DEVICES, MACHINES AND SYSTEMS.....ALBEIT NOT AS ELEGANT AS TESLA'S. DOES IT MAKE SENSE TO POST MY ESSAYS ON YOUR WEB SITE? BUT, I DON'T HAVE TIME TO RESPOND TO PEOPLE. "Editor's note: Time as an energy source is the most important topic of many research efforts. How can we explain this in simple words? To my mind it is the difference in the energy of oscillations that is formulated as E=hv, where v is frequency, that is dependent on scale of space, i.e. velocity of the course of time. Let's assume that some system of energy E can be moved from space A into a local space of accelerated time B. In comparison to space A this means an increase of energy since the wave-length in space B should be shorter. Let's assume some "bridge" or "energy exchange channel" between space A and space B. In this case we'll be able to create some energy exchange between A and B due to a natural gradient of energy density. Prof. Abramovic wrote about "asynchronicity of various levels of physical processes" but a more accurate notion here would be "relative difference in the speed of time", which connects with speed of light and physical properties of space. "Asynchronicity" can be detected for two oscillation processes of the same frequency but in this case it cannot be used to produce a gradient of energy density." This source of energy is actually implicit in the way by which the universe expands. It is not only expansion in space but also in time, which means that the pace of time slowly decreases cosmologically. This is the ultimate cosmological energy source, which eternally sustains the universe. I have attached a recent paper on this. As you can see the new cosmos model, which is based on 4D scale-expansion, has a lot of common with Tesla's ideas. It suggests an all-permeating cosmic field consisting of extremely high frequency, low amplitude, oscillations of the four spacetime metrics. This field is all there is, and matter-particles are resonances in the field sustained by the cosmological expansion. As you can see in the paper, this is more than just speculation. It might be the beginning of a new understanding. "The external reality screens for the projection of the display program in are: the non-self real persons; motion pictures of these persons in various states; still pictures of the persons; pictures of self from the past, motion and still, three dimensional and flat; the here-andnow threedimensional color image of one’s face and/or body in a mirror; and finally, the eyesopen or eyesclosed blank unlighted or lighted projection screen. The blank screen is the most difficult one to work with but is the least “driving” of the group. The blank screen interferes least with one’s creative efforts; it takes more program circuitry to create those aspects which can be furnished by the other screens themselves, from the perception mechanisms directly into the projection program itself. The blank screen does not so easily show the “forbidden transitions” except by remaining blank, i.e., more relaxation and freedom to “free associate” with this visual mode is required to project on a blank screen. The high priority program we are calling the external reality program may tend to usurp the circuitry and take over from the projection program with pictures or voices of known and valued persons. This effect interrupts the projection and its free association. Such interruptions depend upon the individual computer and its conflicts in relation to the projection program versus the external reality program. Purely random noise may avoid these difficulties; it may be a proper acoustically lighted blank screen for crossmodel excitation of the visual projections. Initial experiments with inphase and nonphase noise in the two ears show some new programming possibilities. One pitfall, here, however, is to avoid the initial problem of the programming by the random processes of the noise itself. This tends to result in chaotic programming, i.e., randomness itself can build up to a large intensity within the metaprogramming systems. With adjustment of the acoustic intensity of the two nonphase related noises these effects can be attenuated and the noisily lighted visual screen used for proper projection purposes. Only preliminary experiments have been done in this region as yet." -- what is this except empathy-based resonance with the vibrations of another human body? He said that whenever friends or relatives of his had been hurt by others in a particular way, he himself felt what he could only characterize as a "cosmic" pain. This resulted from the fact that human bodies are of similar construction and exposed to the same external influences, which results in likeness of response. "A very sensitive and observant being, with his highly developed mechanism all intact, and acting with precision in obedience to the changing conditions of the environment," he wrote, "is endowed with a transcending mechanical sense, enabling him to evade perils too subtle to be perceived. When he comes in contact with others whose controlling organs are radically faulty, that sense assert itself and he feels the 'cosmic' pain..." It is obvious from the inventor's writings that he himself was never completely satisfied with his theories on this subject. Tesla's nephew, Sava Kosanovic would later recall how the inventor told him of (such premonitions) but discounted them. He was a sensitive receiver, he said, registering any disturbance - but there was no mystery to it. "He declared," said Kosanovic, "that each man is like an automaton which reacts to external impressions." But what the external impressions were that gave him actual precognition, as hereafter described, he never discussed. He told Kosanovic of an incident that occurred in manhattan in the 1890s after he had given a big party. Some of the guests were preparing to take a train to Philadelphia. Tesla, seized with a "powerful urge," was impelled to detain them, causing them to miss the train. It crashed. Many passengers were injured. He associated a personal anomaly with the anxious rush to his mother's deathbed. A patch of white hair developed on the right side of his head, which was otherwise jet black and thick. After a few months, however, it returned to its natural state. Following his mother's death he was ill for a number of weeks. When finally able to get about, he visited relatives in Belgrade, where he received the welcome due a world-famous native son, and then went on to Zagreb and Budapest. What is said about Vivekananda is wrong in date and also wrong in the subject they have talked about. Vivekananda died in 12th Jan 1902, so no way he could have met Tesla in 1906.
thinks he can demonstrate that mathematically that force and matter are reducible to potential energy." reconcile the teachings of the Vedas with modern science. Apologies - the date of his passing is 4th Jul 1902. My new book TRANSCENDING THE SPEED OF LIGHT: CONSCIOUSNESS, QUANTUM PHYSICS & THE 5TH DIMENSION is now available at Borders, Barnes & Noble and on line such as at Amazon. I have a major section on ether theory, Tesla vs. Einstein. Part of this section is a critical review of Einstein's theory of relativity and why it is a flawed theory. Once he abandoned the ether theory he was unable to unite gravity with electromagnetism. TRANSCENDING discusses Tesla's ether theory and its link to gravity, the constancy of lightspeed and particle spin. Hope some of the readers of this article actually go and get your book! I suppose it would help to look at the page you are commenting on. There is a link for getting updates by email, and there's also an RSS feed. But then ... your concern about getting updates may just be a ruse. The comment seems to be one of those that are posted only to get your link on other people's websites.